Can Tho (VNA) – A seminar on building a farm produce manufacturing and consuming system adaptable to climate change took place in the Mekong Delta city of Can Tho on August 18. The event was part of the APEC Food Security Week and High-Level Policy Dialogue on Food Security and Sustainable Agriculture in response to Climate Change. 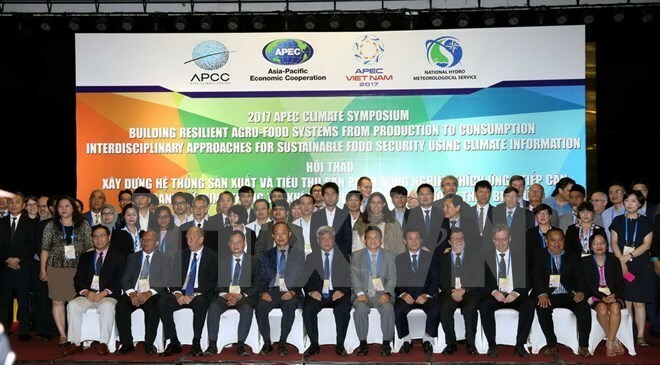 Speaking at the event, Deputy Minister of Agriculture and Rural Development Nguyen Linh Ngoc hoped that domestic and foreign experts and scientists would integrate climate information into sustainable agricultural production chain, helping APEC economies fulfill millennial development goals in the future. Dao Anh Dung, Vice Chairman of the municipal People’s Committee, said Vietnam is one of the countries hard hit by climate change, especially the Mekong Delta region with 13 cities and provinces. He wished that regional experts would share experience in applying technological advances in climate change-adaptable agriculture, so that Can Tho city and other Vietnamese localities could sustainably develop farming towards improving added value, value chain and green growth. Hong-Sang Jung, Executive Director of the APEC Climate Change Centre, said the centre would work closely with the Ministry of Agriculture and Rural Development and participants to recommend ideas to develop common initiatives on enhancing the regional agriculture’s capacity of disaster resilience, including using climate information to serve food security and establishing a multi-national farm produce consumption system that could protect the environment and adapt to climate change. According to him, nearly 800 million people worldwide are suffering from hunger and more than 160 million children aged below 5 are malnourished.